KIEV, Ukraine -- Europe is waiting to hear whether its largest country, Ukraine, will join the EU or Russia on a free-trade agreement. Supporters of former Ukrainian prime minister Yulia Tymoshenko release white birds at a rally Aug. 5, the second anniversary of her being held in prison. If recent exchanges between President Viktor Yanukovych and his Russian counterpart are indicative, there is a definite turn towards the EU. The EU needs Ukraine to comply with some key conditions before the association agreement is signed. Among these demanded reforms are a fix of improper elections and, most importantly, the release of jailed ex-premier Yulia Tymoshenko. There's been progress, but ensuring free elections is not one of them. Last fall's parliamentary elections saw serious vote tampering in five decisive ridings. Opposition party winners were replaced by the president's Party of Regions. Re-elections have yet to take place. Meanwhile, former opposition candidate, Arkadij Kondratskyj, has fled the country with his family. Their lives have been threatened, his business raided by the president's cronies sitting in the country's highest offices, and his staff incarcerated. Kondratskyj's chief accountant was abducted. She's been in jail without charge or trial for nearly six months. Such blatant political abuses would make it easy to say no, but Europe stands to gain economically from an alliance with Ukraine and in an effort to contain Russia's expansionism. Ukraine's patriots and oligarchs are, for once, on the same page with Europe. Both want national sovereignty -- the former to build a strong national state; the latter to access the EU markets. Last week in Kiev, celebrating the birth of Christianity, 988 AD, Yanukovych and Russia's Vladimir Putin could not bear each other's company. Underscoring the rift, Yanukovych cautioned foreign states not to use religion for political ends. This was a direct hit at the head of the Russian Orthodox Church, Moscow's Patriarch Kirill, a devout supporter of a re-emerging empire with theocratic shadings, and Putin's main instrument in coercing global Orthodoxy, and with it economic and political integration, to Russia. Russia's myopic notion of 'yedynyj mir', one Russian world -- a return to the way things were under the Soviet Union -- is the reason Yanukovych has resisted membership in its Single Economic Space, a free trade zone joined by Kazakhstan and Belarus. He knows that his wealth, and that of Ukraine's oligarchs, will be hostage to Russia's aggressiveness. This was made clear when Russia lost patience with one of the leading agro-business oligarchs -- supposedly for not delivering Ukraine to the SES -- and days before arriving in Kiev to spread "brotherly love" banned the import of Ukraine's candy. Small wonder that Yanukovych would like to side with Europe. But first, he must free Tymoshenko. The illegal arrest and incarceration of the opposition leader cannot be dismissed by world democracies. On July 30, the European Court of Human Rights confirmed her rights were violated; the arrest and incarceration were politically motivated. The EU must take the court's decision into account. Some have crowed "Ukraine is more important than one woman," but they miss the significance of the democratic cornerstone. There is much is to be gained from more European integration. It will move Ukraine to the rule of law, good governance, social wellbeing, western standards, freer movements, better quality of life and a much brighter future than the Russian alternative Ukraine experienced under Soviet rule. If he lets her go, most likely EU's November deadline for compliance will be extended. Other democracies, including Canada with some 1.3 million citizens of Ukrainian descent, will step up their own bilateral free trade negotiations, put on hold following Tymoshenko's arrest. And quite likely, some of the president's trespasses will be forgiven. 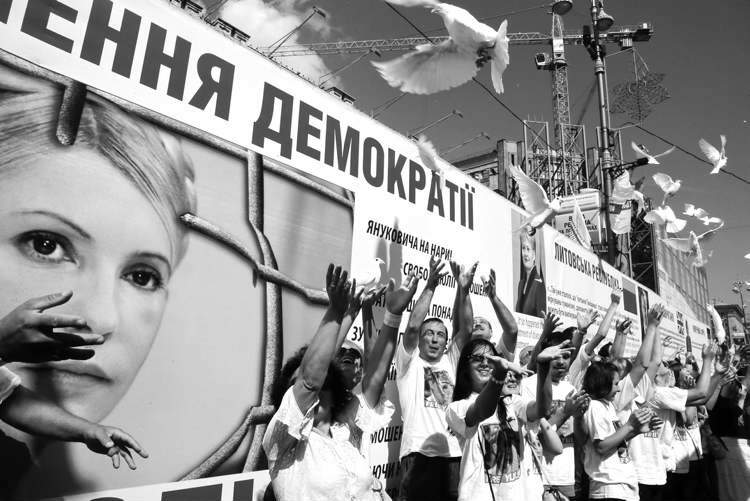 Tymoshenko's freedom is a huge play. It will set in motion great changes for Ukraine, Europe and perhaps, even the world. Canada has been in the forefront in making sure this happens. From day one, Prime Minister Stephen Harper has urged Yanukovych to do the right thing. Now, another nudge is needed to make the right door opens.